The opening reception of the MSU exhibition, "Finding Our Voice: Sister Survivors Speak" will be held from 5:30-7:00 p.m. The exhibit will run from April 16, 2019 until April 30, 2020. This innovative exhibition is co-curated by sister survivors and their allies, reflecting on the vast crisis of sexual violence centered on the MSU campus in recent years. 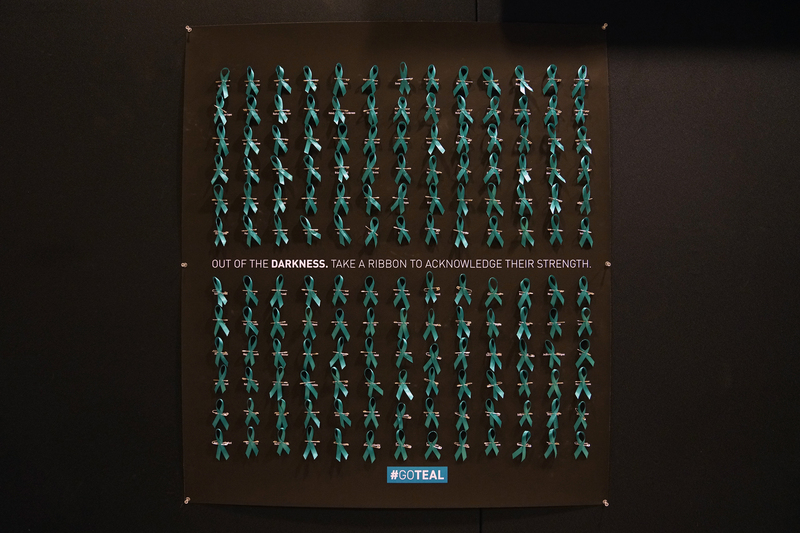 Inspired by hundreds of teal bows and ribbon tied in early 2018 around campus trees as tributes to the survivors, the exhibit chronicles the continuing struggle by the survivors to call public attention to sexual violence and to promote dignity, healing, and positive transformation locally and globally. Visual art, poetry, text, and audio installations celebrate the power of singular and collective voices to challenge injustice, demand institutional accountability and build a better world. A living reminder to each and every survivor of sexual violence that you are not alone, this dynamic space invites interactive dialogue with all visitors, as we consider together strategies to promote institutional change and nurture cultures of safety, compassion, and healing.